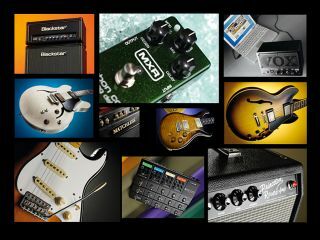 2008 has been a bumper year for guitar gear. From the smorgasbord of products launched back in the first quarter at NAMM and Musikmesse, to the mountain of equipment scrutinised by the experts at Guitarist and Total Guitar magazines, there's been something new and exciting for all tastes and pockets. Throughout the course of the year, we've been blown away everything from humble stompboxes to handwired boutique amps. Without further ado then, in ascending price order, here's MusicRadar's pick of the 10 best guitar products that have rocked our world in 2008. Click on the product name to read our original reviews with audio and video demos. The ultimate jam and practice solution? We said: "JamVOX is a brilliant idea well executed. If you have a computer and want to easily make it into a facility for guitar, you need JamVOX!" Analogue delay sounds of the past with a modern twist. We said: "As a mass-market analogue delay in a conveniently-sized package, there is little around that can touch this pedal." The best entry-level Stratocaster on the market? We said: "Although Squier's Standard Series represents good value, we must now suggest that the Classic Vibe range has become the initial port of call if you're after your first Strat." The best value recording amp on the planet? We said: "The price makes the HT5-S excellent value for money and effectively annihilates all but the most serious competition. It's likely to find a lot of dedicated fans and we suggest you order yours now. There might be quite a rush." Line 6's most ambitious stompbox modeller yet. We said: "For gigging players struggling with an ever more complicated collection of single-sound pedals, it's a must-try. The M13 is really quite unlike anything else on the market today." One of the most legendary amps of all time gets the reissue treatment. We said: "Good value for money if you're after a vintage amp with modern reliability, as long as you can live without the bells and whistles of a flashy modern design. Grab yourself a very toneful piece of history." A downsized ES-335 with upmarket performance. We said: "Gibson has at last turned a corner in terms of quality and consistency. Not only is the ES-339 a great guitar at an even better price, it's undoubtedly one of the best new Gibsons we've ever played." Simultaneously futuristic and classic. We said: "A fabulously carved solidwood design that, via unique pickups, is one of the most versatile electrics we've ever played." The best PRS ever? We said: "For those players who love their old style tone but need more voices the PRS DGT is the pearl in an already impressive range." Guitar amplification doesn't get much better than this. We said: "If you like rootsy, rocky, bluesy tones, then don't dare try this unless you can afford it: unbelievable."